Hi guys! 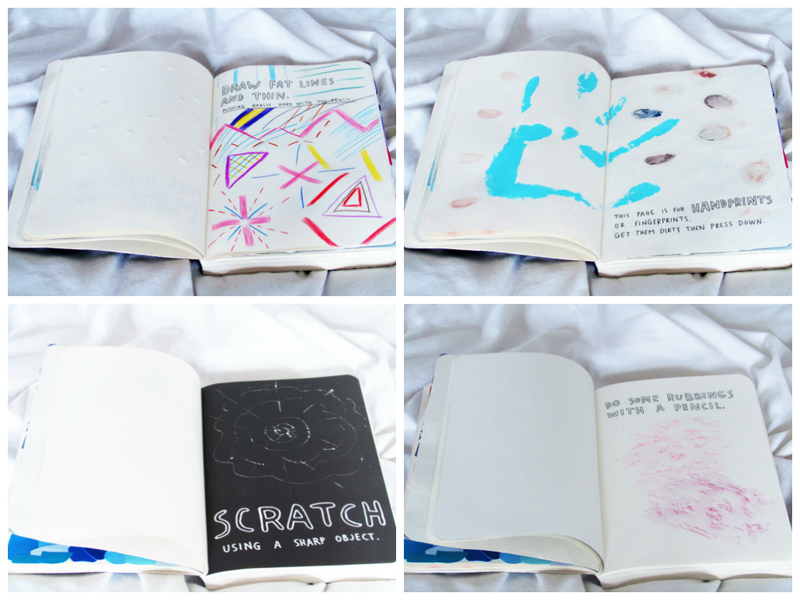 So as requested I said I would start a new project of 'Wreck this Journal' Wednesdays, each week I will post around 10 pages and show you what my book looks like and I will talk you through why I done it etc. Its just a little fun as I know a lot of people have this book and have completed it and/or are in the process of doing it. I've wanted to buy this for ages and suddenly felt the time was right and it is amazing, so if you haven't already - GO BUY IT! The book is said to help with depression and anxiety and has helped stop people self-harming. Personally I find it calming as it gives me something to focus on when I suffer anxiety attacks. It also has lots of activities that can help with negative feelings/thoughts that you are experiencing. You can buy the book from various book stores, I bought mine from Amazon - The link will take you to the exact page. Also mine is the latest updated version, I'm not sure if there is a huge difference as I don't own the older version but I may do a comparison in the near future. Sooooo, I hope you enjoy this little project and lets get started! Not all of the pages are in the right order, but the ones I have missed out I will add at a later day! Page 1 - I still have hardly written any numbers in the book and im not sure why, I don't really like numbers, I'd rather right the alphabet, maybe I should do that instead. Page 2 - I found it really hard cracking the spine as I love my books to be in really good condition without a bend, so I was really gentle at first, but after a while I cracked it properly. Page 3 - I loved this, I love the effect of coffee stains, it makes things look old and kind of reminds me of old maps and things, maybe I'm just weird. I sat flicking coffee at it for ages. 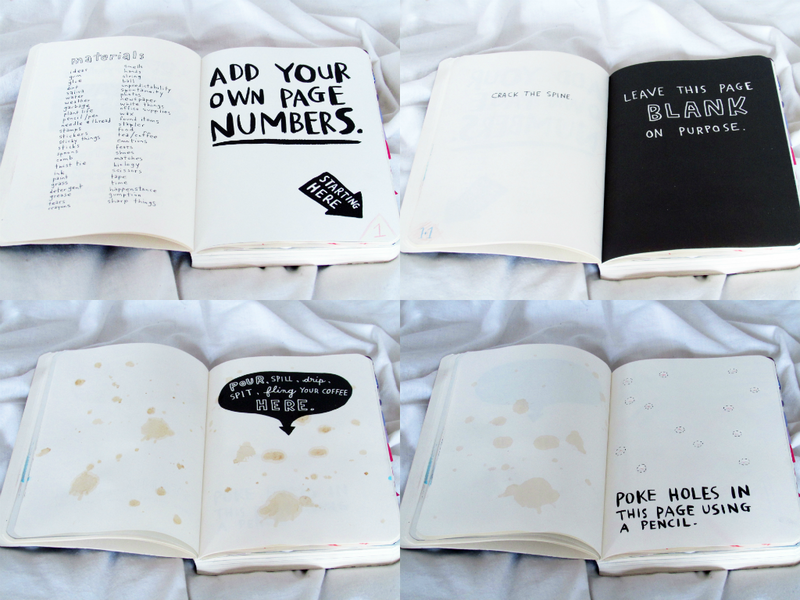 Page 4 - This was so hard, again because I like books to be neat and in good condition, but also because I felt guilty. I was trying to pierce the paper so gently like the book feels pain or something, am I the only one who did that or..? Page 5 - I kind of just did whatever my hand wanted in this, when I feel emotional or angry it's a good way to release those feelings, so I bad something that was ugly look pretty. I always try to make a negative thing/feeling positive. Page 6 - I used a pot of paint (which was the colour I was going to paint my bathroom) and did the hand print, then I used different make up types to do the finger prints, I really enjoyed doing this one! Page 7 - It was a spider web gone wrong, when I was younger we used to do things like this with crayons, then paint of the crayons with black, once dry scratch it off and you can make colourful patterns (maybe ill do this in another video?) so I thought it would be similar but it was a little harder, either way it's my own spider web I guess! Page 8 - So when I was out at the weekend, we got to a bridge going over the river, and there were 2 'S' carved into it, so I kind of felt it was the right place to do some pencil rubbing's, although you can't really see in the picture they look better in person. So this is the first week of Wreck It Wednesdays. I'm quite tempted to do the rest as short videos so you can see the pictures better? Let me know what you think, hope you all enjoyed!